PRECOCIOUS COLT BY 5 TIME GROUP 1 WINNING SIRE! An OUTSTANDING looking colt! PRECOCIOUS COLT BY 5 TIME GROUP 1 WINNING SIRE! An OUTSTANDING looking colt with a COMMERCIAL pedigree- READY TO BREAK IN! Unnamed 2YO colt by Dream Ahead from a winning Desert King mare. This stunning and faultless looking colt is now on offer and is NSW BOBS Eligible, so take advantage of the excellent prize money that there is on offer! Dam: Mimes winner over 1000m. Mimes is the dam of 5 horses for 5 winners, making that a 100% success rate! Her progeny have sold anywhere from $60,000 - $160,000 in the ring. Dream Ahead is an up and coming sire, with many stakes winners to his credit. A five-time group one winner, Dream Ahead was co-European highweighted with Frankel at two, and European Champion Sprinter at three. Dream Ahead carries Sharpen Up through an outstanding sprint filly who is bred very similarly to Kris (sire of Switch in Time), Diesis (sire of Daggers Drawn) and Keen. There is a Diktat stakes winner out of a mare by Sharpen Up son, Trempolino, so it could also be worth introducing this strain through Famous Star or College Chapel. This Dream Ahead Colt's pedigree is A+ grade racing material ! Genuine sale, breed to sell vendors. Well grown and sound. The challenge is on the find a better bred colt than this on the current market! He is a prime example of what a balanced colt should be, who has lots to offer. He is genuinely untried and unbroken, who has an outstanding head on him and very well handled, so here is your chance to build your empire, the foundation is here, there is no need to look any further. All you have to do is choose a trainer, select a name and let your racing journey commence with this future champion! All vet inspections and x rays are encouraged and welcomed. DREAM AHEAD (USA) (Bay or Brown 2008-Stud 2012). 6 wins-3 at 2, Newmarket July Cup, Gr.1. Sire of 256 rnrs, 130 wnrs, 11 SW, inc. Al Wukair (Deauville Prix Jacques le Marois, Gr.1), Donjuan Triumphant, Dreams Aplenty, Final Frontier, Basileus, Pursuing the Dream, Tisbutadream, Visionary, Awaken, Generalissimo, Ken's Dream, SP Boos, Dream of Dreams, Dream First, Dream Mover, Golden Stunner, Raucous, Silent Attack, Dream Kisses, Gorane, Sensei, etc. Not a Pretender (f. by Royal Academy). 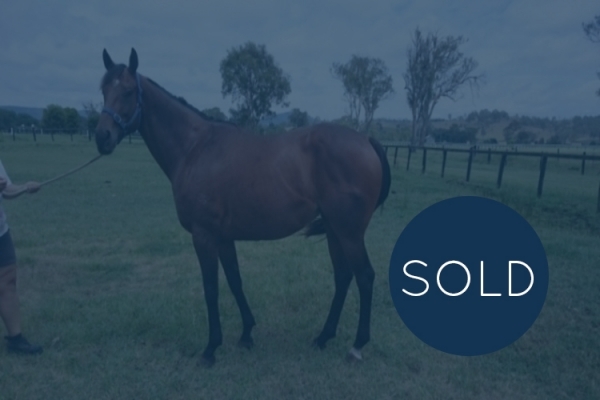 Winner at 2, A$192,680, MRC Inglis Premier 2YO S., 3d AJC Panorama Terraces 2YO H., 4th VRC Thoroughbred Breeders S., Gr.3. Silent Actress (f. by Dehere). Winner at 1350m, 2d BRC Mother Energy H., 3d BRC Sky Racing P.
Essence'nrestraint (g. by Hussonet). 5 wins to 1400m in Aust. King Macedon (g. by Onemorenomore). Winner at 1200m in Aust. Our Belisa. Winner at 1600m in 2016-17, 2d ATC Wilson Asset Management H., 3d ATC Husson at Vinery P., 4th ATC Dulcify H., L.
Hussonator. Winner at 1600m, Singapore TC Speedy Cat S., 3d Singapore TC Initiation P.-twice. HOOFIT (Mossman). 4 wins-1 at 2-to 1400m, US$232,031, NZ$80,275, Keeneland Phoenix S., Gr.3, ARC Bonecrusher S., L, Bayer 2YO H., 2d ARC Champagne S., L, Belmont Around the Cape S., L, Colonial Downs Da Hoss S., L, Saratoga Win S., L, BOP RC Classic Hits 95FM H., Waikato RC Esker Lodge Juvenile H., 3d Presque Isle Mile S., L, 4th Manawatu Sires' Produce S., Gr.1, Calder Tropical Turf H., Gr.3, Matamata RC Slipper S., L.
CRACK ME UP (Mossman). 3 wins-1 at 2-at 1200m, 1600m, A$287,700, to 2016-17, Sunshine Coast Guineas, Gr.3, Qld Tatt's RC Tattersall's Mile H., L, Toowoomba TC Dalrello S., L, 2d BRC Wayne Wilson P., L, Magic Millions 2YO H., SCTC Coastline BMW X4 3YO P., BRC McInnes Wilson Lawyers P., 4th BRC Queensland Day P., L.
Ten Seconds. 10 wins-1 at 2-to 1350m, A$148,200, AJC Randwick Betting Auditorium 2YO H., BRC Sky Racing World P., 2d BRC Epson H., Guardian Financial Planning H., 3d BRC Brc.com.au H.
LADY ROYALE (Captain Rio). Joint Top Filly on The 2013-14 NZ 2YO Free H. 2 wins at 2, NZ$91,700, Matamata Breeders' S., Gr.2, Waikato RC Brokerweb Insurance Broking 2YO H., 2d ARC DHL 2YO H., 3d Waikato RC NRM S., Lowe Schollum & Jones H.
Amoroof. 5 wins from 1600m to 2050m, A$81,900, MVRC Membership H., 3d MRC Robert Hunter H. Producer. BEAUTIFUL BUNS (Black Minnaloushe). 4 wins to 1400m, A$99,682, TTC Vamos S., L, 2d TRC Tattsbet.com H., 3d TTC Southern Cross H., Early Bird Tickets H.
FULL AT LAST (Full on Aces). 7 wins-1 at 2-from 1200m to 2800m, NZ$7,105, A$144,700, VRC St Leger, Gr.2, SAJC Instant Money H., VATC Gainsborough H., Woorak Welter H., VRC Yarraville Welter H., VATC Belmont H., 2d VRC Tauto Welter H., 3d Werribee Cup, L, SAJC Roulette H., VRC Herald H., 4th VATC CF Orr S., Gr.2, Waikato Guineas, Gr.3, Cambridge JC Logan Insurance P., L. Sire. BLEVEEKA (Blevic). 3 wins-2 at 2-at 1000m, 1050m, A$111,390, MVRC William Crockett S., L, SAJC Alcohol Go-Easy 2YO H., Morphettville Junction 2YO H., 2d SAJC Cardboard Cartons of SA H. Producer. Tora Tora Tora (Tayasu Tsuyoshi). 10 wins-1 at 2-from 1550m to 2100m, A$378,920, Townsville Cup, SAJC Scott Group of Companies H., Pope 2YO H., 3d SAJC Port Adelaide Guineas, L.
SISTER HAVANA (General Nediym). Second top filly on 2009-10 NZ 2YO Free H. 3 wins-2 at 2-to 1200m, NZ$572,500, A$32,700, ARC Karaka Million, L, BRC Blum 2YO P., 2d Matamata Breeders' S., Gr.2. Tchaikovsky (Snippets). 8 wins at 1200m, 1400m, HK$6,252,850, HKJC Lek Yuen H., Sha Tin Raceourse Anniversary Cup, Amah Rock H., 3d HKJC Premier Bowl H., L.
AMELIE'S STAR (Testa Rossa). 5 wins from 1600m to 2400m, A$370,935, to 2016-17, SAJC Queen of the South S., Gr.2, ATC Colin Stephen H., Gr.3, More Than Ready at Vinery H., Pro-Ride H., 2d VRC Long Tan H., 4th BRC Doomben Cup, Gr.1. BRAZUCA (Teofilo). 5 wins from 1200m to 2000m, R1,940,025, to 2016-17, Turffontein Colorado King S., Gr.2, Guineas Day 4 March P., Racing It's a Rush P., Vaal Sansui Summer Cup Tickets Available at Computicket Graduation P., 2d Greyville Golden Horseshoe, Gr.1, Kenilworth Cape Guineas, Gr.1, Cape Derby, Gr.1, Turffontein South African Classic, Gr.1, Storm Bird S., L, 3d Turffontein Champions Challenge, Gr.1. MR UTOPIA (Elusive Quality). 10 wins from 1200m to 1600m, A$424,519, WATC York S., L, 2d VRC Winter Championship Final H., L, WATC Grandstand Cup, L, 3d WATC Belmont Sprint, Gr.3. PROM QUEEN (Super Easy). 5 wins at 2, NZ$95,750, in 2016-17, CJC Champagne S., L, Welcome S., L, New Zealand Bloodstock Ready to Run Sale 2YO S., Gavelhouse.com 2YO S.
SWISS ROSE (Thorn Park). 2 wins at 1200m, A$133,500, BRC Mode S., L, 3d Qld Tatt's RC WJ Healy S., Gr.3, GCTC Silk Stocking H., L, Qld Tatt's RC Tattersall's Classic, L. Producer. LIFE'S A BOUNTY (Bahamian Bounty). 6 wins from 1300m to 1750m, A$455,400, SAJC RA Lee S., Gr.3, Seymour Cup, L, Geelong RC Briseis Gold Cup, MRC Nearest H., 3d MVRC AAMI Vase, Gr.2, Seymour Cup, L, VRC Auckland Racing Club Metric Mile H., L.
REWARD FOR EFFORT (Exceed and Excel). 4 wins-2 at 2-to 1200m, A$937,200, MRC Blue Diamond S., Gr.1, STC Concorde S., Gr.3, MRC Blue Diamond Preview (c&g), L, Sir John Monash S., L, 2d MRC Blue Diamond Prelude (c&g), Gr.3, 3d MVRC Ian McEwen S., Gr.3. Sire. CONSULAR (Royal Academy). 16 wins from 1050m to 1700m, A$1,020,450, Qld Tatt's RC Tattersall's Mile, L, 2d QTC Stradbroke H., Gr.1, QTC Cup, Gr.2, 3d VRC Blamey S., Gr.2. OVERREACH (Exceed and Excel). Champion 2YO Filly in Australia in 2012-13. 3 wins at 2, A$2,360,800, ATC Golden Slipper S., Gr.1, Reisling S., Gr.2, Widden S., L, 2d MRC Debutant S., L, 3d ATC Sires' Produce S., Gr.1, MRC Schillaci S., Gr.2. CHARMED HARMONY (Hussonet). 13 wins to 1500m, A$663,720, MRC Sandown S., Gr.3, Charter Keck Cramer P., Hockingstuart H., 2d MRC PB Lawrence S., Gr.2, Victoria H., Gr.3-twice, Thoroughbred Club 50th S., L.
SUYOOF (Magic Albert). 4 wins to 1450m, R420,125, 389,020Dhs in South Africa and U.A.E, Turffontein Tony Ruffel S., Gr.3, Secretariat S., L, Meydan Al Naboodah KAESER Compressor Trophy H., 2d Meydan Zabeel Feedmill H., 4th Turffontein South African Classic, Gr.1.